Scarlet Queen Turnip. It is Not a Radish! My grade for naming red root vegetables at the Wednesday Boulder County Farmers’ Market = F. Well, maybe more like a C minus. Once I learned that Scarlet Queen Turnips are not radishes, I was able to identify the actual radishes on the table next to the turnips. It’s the greens that should have been the dead giveaway. Turnip greens are more than twice the height and width of the radish. 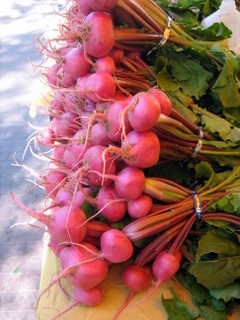 But, at the time, my brain could not entertain the possibility of the existence of a brilliant red turnip.